Confocal microscopy has traditionally been limited in its capabilities. But now, advances in optics technology are expanding its life sciences efficacy. Confocal microscopy is not a new technique for life sciences applications. But it has steadily advanced since its inception decades ago, becoming a valuable tool for the life sciences. The technique presents challenges, however, because it has a limited depth of focus. To address these limitations, some researchers and product developers are revamping the microscope’s fundamental optics — specifically, combining confocal techniques with other forms of microscopy such as multiphoton and optical coherence tomography. This stack of confocal microscope images shows the distribution of actin filaments throughout a cell. 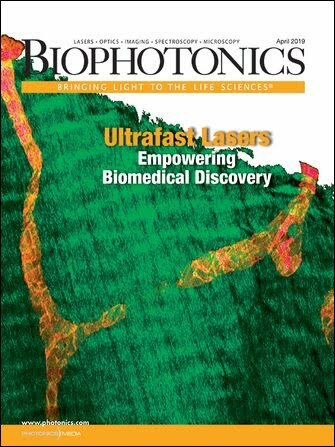 Several imaging and laser industry experts spoke with BioPhotonics, offering their insights into the advancement of confocal microscopy technology, novel improvements for more effective and efficient application in the life sciences, and what it all means for the future. Marco Arrigoni is director of strategic marketing for scientific lasers at Coherent Inc., based in Santa Clara, Calif. During his 27-year tenure at Coherent, he has held various positions in R&D, international sales and business unit management. He holds a master’s degree in electrical engineering from Politecnico di Milano. Matthias Schulze is director of marketing for OEM components and instrumentation at Coherent. He joined the company in 1995 as a sales engineer in Germany before moving into various positions in marketing. He holds a Ph.D. in physics from the Technical University of Berlin. Sam Tesfai is global sales manager of the Imaging Systems Group at Thorlabs, based in Newton, N.J. He joined Thorlabs two years ago after more than a decade with Olympus, where he served most recently as regional vice president of sales. He holds a master’s degree in electrical engineering from the University of Virginia. Q: What do you envision as the “next big thing” in confocal microscopy? Tesfai: Fundamentally, confocal is an old technology, with only small, incremental improvements occurring. Automated, easy-to-use box types of confocal are gaining popularity as they solve the complexity issue that has plagued traditional confocal systems. Ongoing improvement of scientific-grade cameras will incrementally improve spinning disk confocal performance. Finally, the advent of low-cost confocal systems will eventually make this technique ubiquitous for labs employing fluorescence techniques in their research. Schulze: An important trend with wide implications is the move to integrate different imaging modalities in a common database format. In particular, I’m talking about combining confocal fluorescence microscopy information with data from the atomic force microscope (AFM) and reflection electron microscope (REM). Historically, these have been quite distinct disciplines often used in isolation. Today, more and more researchers are interested in linking macroscopic properties and behavior — such as memory learning — with microscopy at the single cell and subcellular level, as well as studying molecular events such as gene control and neuronal activity like excitatory and inhibitory signaling. No single imaging method can cover the broad size and information spectrum involved. This diagram demonstrates the principle of confocal microscopy. Arrigoni: There can be no question that the most exciting advances are in neuroscience. The pace of breakthroughs is incredible, thanks to a combination of brilliant scientists and massive funding initiatives in the U.S., Europe and Asia. Some of these hot developments are dependent on the very latest laser sources. Specifically, the main requirement for deeper imaging is more laser power (or energy) at longer wavelengths. At this time, the key wavelength windows appear to be around 1.3 µm and 1.7 µm, as these minimize tissue damage, scattering and unwanted absorption, and also match the absorption of several available probes. Q: What are the biggest challenges for new advances in confocal microscopy? Schulze: Fluorescence microscopy is unmatched in its ability to provide images with chemical specificity. Moreover, in the confocal format, fluorescence microscopy can provide this information in vivo. An ever-growing range of genetically modified lab subjects — from fruit flies to mice — that express fluorescent probes tagged to different gene products — think GFP and the like — serve to further expand the utility of the method. But the optical microscope cannot reach molecular resolution; even superresolution methods struggle to get below 20 nm. Plus, the complexity of superresolution methods significantly limits the application space. Arrigoni: The fact that most important functions of the brain of model animals such as mice take place in the cortex — the upper/outer layer of the brain with a thickness between 1 and 3 mm — leads me naturally to the most important trend and challenge in this field: Researchers want to image deeper and deeper into and below the cortex to study different parts of the brain and also to simultaneously study larger networks of neurons in a 3D space. To do so, researchers need imaging depths greater than 1 mm and imaging areas as wide as 10 mm. Tesfai: The lack of development in photomuliplier tube technology. Confocal relies upon rapid, large photodetectors, with high quantum efficiency and low electronic noise. There are promising developments in generating large chip-based detectors that might eventually supplant PMTs [photomultiplier tubes] in microscopes, but as yet these technologies are not mature. Q: What do you anticipate for the future? Schulze: Researchers need increased resolution, chemical specificity and the ability to get this information from live samples. The inevitable solution is to use more than one method — confocal fluorescence microscopy, AFM and REM. We see this trend reflected in the instrumentation market by several key mergers and acquisitions as companies try to broaden their portfolio and often integrate one or more methods in a single platform. We are seeing this clearly reflected in our business, too. Years ago, we primarily supported this market with standalone lasers, but today we see a growing demand for our photonic subsystems and modules. These OEMs emphasize the specifications for a final shaped/focused beam or set of beams, rather than a laser. This lowers the cost of developing new instruments and speeds their time to market. Tesfai: Confocal remains the workhorse for fixed slice tissue imaging and for live cell imaging of samples up to 100 µm thick. It will be partially supplanted by structured illumination imaging, but will remain the dominant technology for slice imaging and fixed slide imaging for the foreseeable future. The unit of the dose of any radiation that produces the same biological effect as one roentgen of x-ray. Sizable enough to be perceived by the unaided eye.